PKG was proud to sponsor the Fridge Magnet Art Challenge in 2016 which sent 4” sq /10cm sq magnetic canvasses to over 100 volunteer artists around the world – This unique collection of art was then auctioned off, raising over £2000 for UK children’s cancer charity Supershoes – www.supershoes.org.uk. Following the success and popularity of this event, which was premiered at Kustom Kulture Blastoff, over 200 artists have shown interest in taking part for 2017. Why not sponsor a tile for the 2017 challenge? 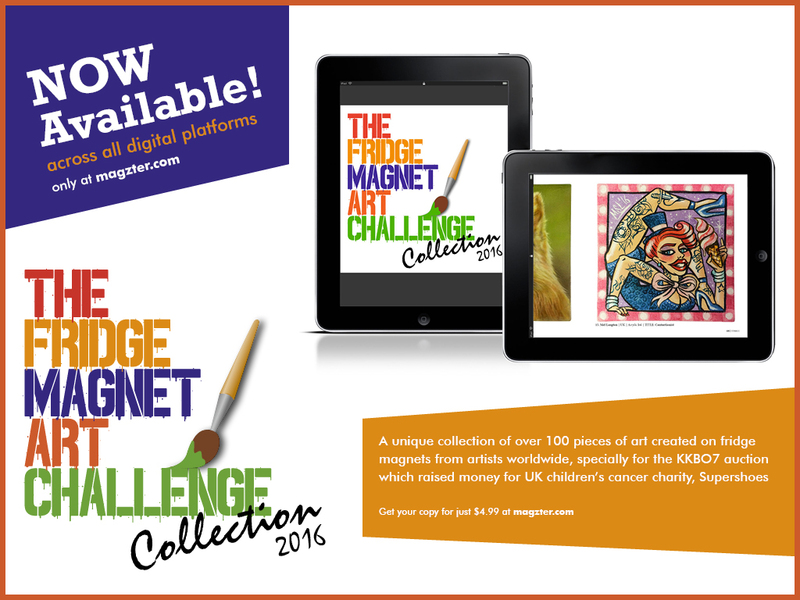 Simply purchase the Fridge Magnet Art Challenge Collection e-Book we’ve produced. It features over 100 pages showcasing all the 2016 entries and artists include; Steve Kafka, Steve Gathercole, Kiwi Terry, and many more . Buy this fantastic e-Book for just $4.99 to sponsor a tile for the 2017 challenge and we’ll send you details of the artist who will paint your sponsored tile for auction. All profits from your purchase will be used to fund the materials, packaging, postage, handling and administration for the 2017 challenge.